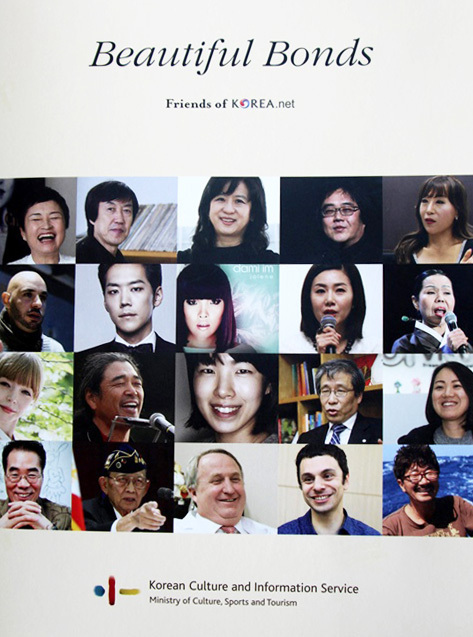 “Beautiful Bonds: Friends of Korea.net,” a new book that tells the stories of 35 “Koreaphiles,” is a tribute to those -- both Korean and foreigner -- who have taken an interest in Korea, discovered its charms and helped spread its culture to the global audience. Artists such as French animator Samir Dahmani, who captures the people and neighborhoods of Seoul in his drawings, and Kim Soo-jung, the creator of the staple Korean cartoon character “Dooly,” are also introduced. From the literary world, critic Kim Seong-kon, a columnist for The Korea Herald who is known for his English translations of Korean literature, speaks on how translation creates bridges between different cultures and enriches them. The second chapter, titled “Human Story,” spotlights those who underwent hardships in Korea to defend causes they believed in. A 2013 article on Fidel Ramos illustrates the former Filipino president’s wartime experiences and his firm belief in the importance of democracy. The story of the U.S.-born In Yohan, who became a naturalized Korean citizen in 2012, tells of the medical doctor’s passion for helping others, his fondness for the Korean notion of “jeong,” or warm emotional bond, and the trials that his missionary ancestors suffered in Korea during the Japanese colonial rule. The third chapter, “Koreaphile,” introduces those who have shown a deep affinity for Korea or strived to spread its culture to the world. Included are the stories of Park Jin-sun, the CEO of Sempio Foods Company who has contributed to the globalization of traditional Korean condiments such as soy sauce and gochujang soybean paste; James Hooper, the mountain climber and adventurous traveler who journeyed from Seoul to Jeju in under 100 hours without the help of motor vehicles; and Charles Usher and Elizabeth Groeschen, two Americans who run “Seoul Suburban,” a blog that explores Seoul’s subway stations and nearby attractions. The book is set to be distributed to over 170 diplomatic offices and cultural and educational institutions abroad and contains both Korean and English versions of the articles. It is published by Korea.net, a website that delivers news on Korea in nine languages and is operated by the Korean Culture and Information Service of the Ministry of Culture, Sports and Tourism.